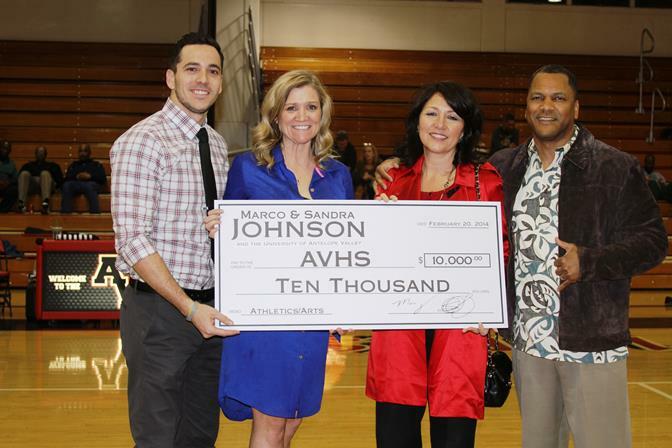 LANCASTER – University of Antelope Valley founders Marco and Sandra Johnson Thursday night made another $10,000 donation towards their $100,000 commitment to the Antelope Valley High School Athletics & Arts Department. The Marco and Sandra Johnson Foundation is a charitable, nonprofit organization established to assist individuals and families in need throughout the Antelope Valley. The Foundation advances this mission by providing charitable services, educational scholarships, clothing and food. “The donations made by Marco and Sandra Johnson to Antelope Valley High School has been significant in helping athletics and the arts at the school. Not only are their monetary donations of $10,000 a year critical to supporting our programs, their continual presence as alumnus at community events, involving the high school, has helped shape Antelope Valley High School. Marco and Sandra Johnson have shown how members of a community can truly impact positive change at a school,” said Antelope Valley High School Athletic Director Jason Chronister. “The arts have always been a positive outlet for me and played an integral part in helping me stay focused in school and on my academic studies. We hope that, by doing our part in supporting the arts department, that we’ll be able to help others do the same,” said Marco and Sandra Johnson Foundation co-founder and University of Antelope Valley Vice President Sandra Johnson. For more information on the Marco and Sandra Johnson Foundation or how you can become a contributing partner, visit www.marcoandsandra.org or contact Ashley Sirmons at 661-726-1911 ext. 126.